HOW CAN I CALL AN AMBULANCE IN TANZANIA? HOW DO I CALL FOR HELP? As reported by the Tanzanian authorities in WHO’s 2013 Global Status Report on Road Safety, 112 is the official emergency number in Tanzania, routing calls to the police department. However our in-country contacts report that outside of the main commercial city of Dar es Salaam, the 112 number does not consistently work in all regions. You may either get an automated voice system which prompts you to choose either Swahili or English, then you are placed on hold indefinitely until the call drops or the call may not connect at all. Recently, there have been efforts to ensure that 114 for reporting a fire emergency is available in all regions though it may not work with all mobile providers. Currently, there are no government provided emergency ambulance services in any region of Tanzania. Ambulances are primarily used to transport patients between referral health facilities. There are some private companies in Dar es Salaam & Arusha who offer ambulatory services as well as air evacuations though due to lack of runway lights at most airstrips in Tanzania, medevacs can only take place during daylight hours. CAN I CALL FOR HELP ANYWHERE? No, coverage by emergency medical services is limited, largely to Dar Es Salaam and other major metropolitan and/or tourist areas. Upcountry regions have can have limited network coverage and the emergency lines often are not working. A study of Kilamanjaro Christian Medical Centre, a major referral hospital in the northern city of Moshi, found that there was no evidence of prehospital care in the region. The average time to arrival to the hospital was greater than 1 hour. A minority of patients were transported to the hospital in ambulances while most are transported by Good Samaritans in private cars or motorcycles (Rotich 2015). The traffic police and fire department do not have ambulances and may transport you in the back of their pickup to the nearest health facility. However due to lack of resources do not rely on this option. WHAT OTHER EMERGENCY NUMBERS CAN I CALL? Tanzania has two official lines for essential public safety and health services. 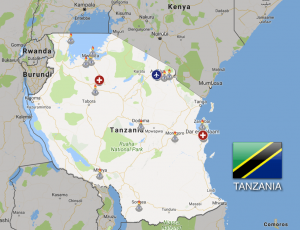 Many government travel advisory websites (eg: https://travel.gc.ca/destinations/tanzania) list 112 or 111 as the emergency line to call however these numbers do not work in many regions outside of Dar es Salaam. Not all cell networks are connected with 114. Each region has various networks which may work, however currently Vodacom and Halotel are the most reliable, Tigo is limited and Airtel does not work in most regions. Your call will be routed based on your cellphone GPS location to the nearest firehall or police station. You may encounter a language barrier as the call maybe answered by a Swahili speaker with very limited English. Try to enlist someone to assist with translation if possible when calling to report an incident or request emergency service. The Emergency Medicine Association of Tanzania (EMAT) offers emergency care training for different levels of providers. Read here for a full list of Short Courses offered by EMAT in Dar Es Salaam. The availability of trained prehospital emergency care providers (i.e., “EMTs” or “Paramedics”) is scant and documentation and/or websites detailing their existence is equally scarce. HOW WILL I GET TRANSPORTED? Medical transportation by ground ambulance or fixed wing aircraft are the options with private providers. However if you are up country out of the major cities, you will most likely be transported by private vehicle, taxi, motorcycle or occasionally in a police or fire vehicle. In the case of medivac, the company must speak first to the attending doctor in order to assess whether a flight is necessary. The fixed wing aircraft will land at the nearest airport and you will need to be transported to the airstrip. Please note that the evacuation can only take place during daylight hours due to lack of landing lights at most airports in the country. Also the patient will need to have their passport and a valid yellow fever card with them in order to gain entry in to Kenya or South Africa. WHERE WILL I BE TRANSPORTED TO? Tanzania has a government health referral system (as in the diagram below) in which patients are escalated based on the extent of their illness or injury. 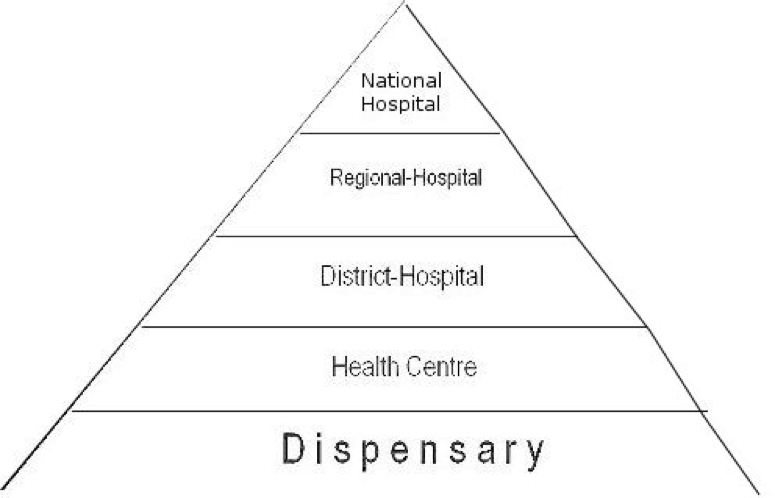 As previously noted, not all hospitals have ER facilities however most regional hospitals are well equipped. There are also private and mission hospitals which can provide a reasonable level of care. You will most likely be transported to the nearest medical facility and then transferred/referred to a higher level facility. If you are conscious and able to speak for yourself, you may direct the transport to a particular hospital if you have the means to pay for such service. In the case of medevac, the most common destinations are Nairobi Kenya & Johannesburg South Africa. It will depend on what is specified in your insurance coverage. According to a 2013 post on AllAfrica.com: “DEPUTY Minister for Regional Administration and Local Government, Mr Aggrey Mwanri, has said that ambulance services are supposed to be free of charge. Check with your health insurer before traveling to Tanzania to see if they cover you overseas, and to see if they cover emergency evacuation in the event of a serious health issue. All healthcare related activities in Tanzania are governed by the Ministry of Health, Community Development, Gender, Elderly and Children. However, there are no national guidelines or governance in Tanzania specifically for prehospital emergency care. Adhvaryu AR, Beegle K. “The Long-Run Impacts of Adult Deaths on Older Household Members in Tanzania.” Economic Development and Cultural Change; 2012;60(2):245–77. Baker T, Lugazia E. “Emergency and critical care services in Tanzania: a survey of ten hospitals.”BMC Health Serv Res. 2013 Apr 20;13:140–9. Casey ER, Muro F, Thielman N. “Analysis of traumatic injuries presenting to areferral hospital emergency department in Moshi,Tanzania.” Int J Emerg Med. 2012 Jul 30;5(28):1–7. Chalya PL, Dass RM, Mchembe MD, Mbelenge N, Ngayomela IH, Chandika AB, et al. “Citywide trauma experience in Mwanza, Tanzania: a need for urgent intervention.” J Trauma Manag Outcomes; 2013 Nov 11;7(1):1–1. Chalya PL, Mabula JB, Dass RM, Mbelenge N, Ngayomela IH, Chandika AB, et al. “Injury characteristics and outcome of road traffic crash victims at Bugando Medical Centre in Northwestern Tanzania.” J Trauma Manag Outcomes. BioMed Central Ltd; 2012 Feb 9;6(1):1. Cox M, Shao J. “Emergency medicine in a developing country: Experience from Kilimanjaro Christian Medical Centre, Tanzania, East Africa.” Emerg Med Australas. 2007 Oct;19(5):470–5. Evjen-Olsen B, Olsen Ø, Kvåle G. “Achieving progress in maternal and neonatal health through integrated and comprehensive healthcare services – experiences from a programme in northern Tanzania.” Int J Equity Health. 2009;8(1):27. Kuzma K et al: “The Tanzanian trauma patients’ prehospital experience: a qualitative interview-based study.” BMJ Open. 2015;5(4):e006921. Little RM, Kelso MD, Shofer FS, Arasaratnam MH, Wentworth S, Martin IBK. “Acute care in Tanzania: Epidemiology of acute care in a small community medical centreLes soins aigus en Tanzanie: Épidémiologie des soins aigus dans un petit centre médical communautaire.” Afri J Emerg Med; 2013 Dec 1;3(4):164–71. Lund Sorensen B, Bruun Nielsen B, Raschl V, Elsass P. “User and provider perspectives on emergency obstetric care in a Tanzanian rural setting: A qualitative analysis of the three delays model in a field study.” African Journal of Reproductive Health. 2011 Sep 1;15(2):117–30. Nicks BA, Sawe HR, Juma AM, Reynolds TA. “The state of emergency medicine in the United Republic of Tanzania.” Afri J Emerg Med; 2012 Sep 1;2(3):97–102. Pereira C, Mbaruku G, Nzabuhakwa C, Bergström S, McCord C. “Emergency obstetric surgery by non-physician clinicians in Tanzania.” Int J Gynaecol Obstet; 2011 Aug 1;114(2):180–3. Reynolds TA, Mfinanga JA, Sawe HR, Runyon MS, Mwafongo V. “Emergency care capacity in Africa: A clinical and educational initiative in Tanzania.” J Public Health Policy 2012 Dec 5;33(S1):S126–37. Rotich, CC. Evaluating Access to Prehospital Care for Traumatic Brain Injury Patients in a Resource Limited Setting: Focus on Prehospital Transport. INJ PREV2015;21:A9 . Schmid T, Kanenda O, Ahluwalia I, Kouletio M. “Transportation for Maternal Emergencies in Tanzania: Empowering Communities Through Participatory Problem Solving.” Am J Pub Health. 2001 Oct 17;91(10):1589–90. Spangler SA. “Assessing skilled birth attendants and emergency obstetric care in rural Tanzania: the inadequacy of using global standards and indicators to measure local realities.” Reproductive Health Matters; 2012 Jun 1;20(39):133–41. Stal KB et al: “Women’s perceptions of the quality of emergency obstetric care in a referral hospital in rural Tanzania.” Trop Med Int Health. 2015;20(7):934-40. This database is intended for people who want to know how to call an ambulance in different countries – a question we happen to be trying to answer ourselves every day. Any data, links, reports, assessments, opinions or other pertinent information regarding the contents of these pages should always be double-checked with the source directly. If you’d like to contribute, we’d be very happy to have the help – please send us an email! quality of services provided by the persons, entities and/or institutions included in our database. Inclusion on this list is in no way an endorsement by Trek Medics. The person contracting the service is responsible for payment (i.e. Trek Medics does not pay). ATENCIÓN: Trek Medics International no asume responsabilidad alguna por el desempeño profesional, confiabilidad, reputación o calidad de los servicios proporcionados por las siguientes personas, entidades y/o instituciones incluidas en nuestro base de datos. Su inclusión en esta lista no implica en ninguna manera un respaldo por parte de Trek Medics. La persona quien contrata el servicio es responsable para el pago (Trek Medics no paga).